Whenever I start a fibre related project (which is usually knitting) I generally don't start up a project page in my Ravelry notebook right away. I typically wait a bit until the project is fairly underway before I feel like I can commit to granting the project its own page...and yeah, admitting that the project actually exists. You see, sometimes I get bouts of Starteritis and half of the time I'm casting on ALLLLL the projects that I want now, and the rest of the time I have no idea what I'm casting on. In cases like this I find it's the survival of the fittest - the project has to have the right marriage of yarn and pattern, the pattern itself must be enjoyable, and depending on my mindset the knit needs to have a certain level of speed to it. As in if I'm looking for instant gratification the knit should practically be knitting itself up or I need to see results within the first day. Or if the project has all the above characteristics listed and just happens to be a sweater, then that project just won the game and I'm totally up for ditching the other newly started projects and spending more than a weekend working on it. If a project wasn't started due to Starteritis I still wait just in case things don't work out. For example, I could dislike the gauge I'm getting once the fabric gets bigger than my swatch and I get a better idea of how it will really look in the end, or I could wind up not loving the pairing of yarn to pattern. Yes, I know you can delete project pages on Ravelry if things don't work out but I don't want to have to do that. I'm weird like that. So I usually wait. Sometimes though, I wait too long and end up not creating a project page at all. It's rare, but it does happen. As was the case with this non-knitting but fibre related project. Before my wrists and hands got really bad I was digging around my stash and came across a long forgotten project bag. Inside was a crochet project (I know...me, crochet??) that I had started many, many moons ago and had no idea why I stopped working on it, especially since the project was being worked up in one of my most favourite colour combos of all time. The project: a giant granny square blanket. I'm just going to assume that I had stopped working on this project for two reasons: one, I most likely ditched it for a knitted sweater project; and two, it's crochet. Just so you know, I don't do crochet. I'm so not a crocheter. Don't take this the wrong way, I have nothing against crochet, it's just that I know nothing about crochet and it confuses me to no end. Most of the time I have no idea which stitch is which and where I should be sticking my hook into. Crocheters always make it look so incredibly easy and they whip up cowls in a blink of an eye or a blanket in a matter of a few days. But once I get my hands on a hook...a panicked frenzy ensues and nothing actually materializes or happens, unless you count the inevitable hook and ball of yarn flying across the room in sheer frustration as a form of progress. This particular project though, I honestly cannot say much about it. I have no idea when it was started, why I thought I could do it...I don't even know what hook size I was using!! I literally left myself no notes as to what I was doing. Nothing. Zilch. The project bag contained a 20" square WIP attached to half a ball of yarn, 3 crochet hooks, and an extra ball of yarn. Since I didn't make a Ravelry page for this project I had to find alternative ways of gathering some sort of information about what was going on with this WIP. I searched my Ravelry stash page and discovered that I at least had the good sense to record the yarn and learned that I had bought 3 skeins of it at my LYS in the Spring of 2010. I have a feeling that's approximately around the time I had started this blanket. I didn't say why I had bought the yarn or what I had in mind for it, but I have a feeling that I bought it because it was pretty (I like to think I have since learned to make better and more wise yarn purchases). I searched all websites where I kept photos stored and aside from the stash photos only found the above 2 photos. That purple crochet hook that you see in the first photo? Yeah, it wasn't among the 3 hooks found in the project bag. Nice going Melissa, way to mess with yourself and practically guarantee that this blanket will never get done. Before I forget to mention it (and before I get emails asking what it is), the yarn I'm using for this blanket is Noro Taiyo Aran. It's an interesting mix of cotton, silk, wool, and nylon that I'm not sure I would ever knit with (cotton always makes my hands hurt) but seems to be fine with crochet. I have a love/hate relationship with Noro - I absolutely love their beautiful and vibrant colourways, and while I like the idea of thick and thin yarn I'm definitely not a fan of knitting with it (I can't handle the uneven gauge). I've also been burned a few times too many in which a really thin part of the yarn (re: we're talking thinner than thread) had snapped in half on me. Then there's the whole issue with variegated colourways...if you know me or have been reading this blog for a while you'd know that I don't do variegated colours other than on my socks. I just can't handle not being in control of how the colours work up and when/where/how they will inevitably will pool or flash. Luckily a simple pattern like a granny square works magnificently with long colour repeat yarn like Noro. My knowledge of crochet is so limited that I didn't even know what kind of stitch I was using. 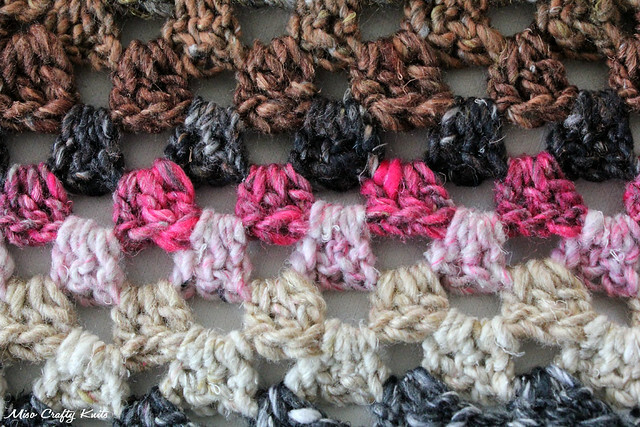 After perusing a few basic tutorials online and crocheting a few stitches with each of the hooks found in the project bag, I learned that I was hooking clusters of 3 double crochet stitches with a single chain between each cluster. From what I gather, I think this is typical for a granny square. Out of all the tutorials that I came across I think I found the one that I was originally following, due to the familiarity of the blog name and the instructions (it's over on Meet Me At Mike's, in case you're wondering), but I think I'll be referring to the Purl Bee's post for their version of the blanket (here, if you want to check it out) as I really like how clear their tutorials and photos are. But I think it's safe to say that what I'm doing is the most basic of basic beginner stuff and so finding help in case I screw up would b pretty easy. I attempted to crochet a round (which took me f.o.r.e.v.e.r!!) and while I was making my way around the blanket I noticed that I had made a few mistakes. A couple of times I had made a solo double crochet stitch when it should have been a cluster, and I think I was screwing up with how I started the next round. One thing I like about crochet is that it's much easier to rip back than it is with knitting, so I ripped back to the first noted solo stitch and carried on. I really have no idea what in the world I did or what I'm doing wrong at the start/end of my rounds so I decided to leave them alone. It doesn't bug me and really, this is my first go at making a crochet blanket. I think I can give myself a break here. The game plan, as you would've guessed based off of the title of this post, is to crochet a giant solo granny square big enough to fit on top of my king size bed. I only have 3 skeins of this Noro in my stash so most likely I'm going to have to find some more. I think my LYS no longer carries the yarn, at least I haven't seen a single skein of it in the shop, unless I'm totally blind and unaware (I wouldn't put it past me). So if anyone local has seen this yarn (in colour "1"...yeah, such a boring name for a beautiful colourway) please let me know! I think I'm going to need at least another 4-6 skeins! Sadly I won't be able to work on this project until my wrists are better. I thought I could squeeze in some hooking here and there with my wrist splints on, but I discovered that the crochet motion is even worse for my wrists than knitting is. I also think I crochet like a freak of nature. Seriously. I look like I'm doing the chicken dance when I'm crocheting. My right arm flaps all over the place while I awkwardly try to hold onto the fabric with the left. 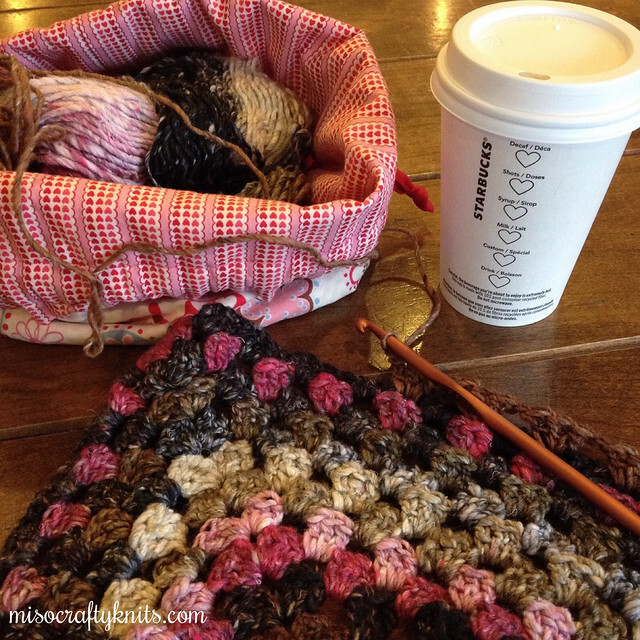 I think I've raised a few eyebrows the last few times I've crocheted in public. Even though I can't work on this project I thought I would blog about it anyways, cause who knows when I'll actually be able to work on it again...but when I do, I want to make sure I have some notes about it to refer to! Does anyone else do this? Start and work on projects and completely forgetting to write down anything about said project? I wonder what else I can find amongst my stash and crafting supplies? A part of me is scared to find out! That's a beautiful colourway! But ya, crochet is way harder on the wrists than knitting. Which is too bad, because it's also way quicker than knitting. I was totally lured in by the quickness of crochet but yes, SO hard on the wrists! I thought maybe it was the way I was crocheting but even those who do a lot of crochet have mentioned how they can only crochet in spurts. I think I'll avoid crochet altogether until my wrists are completely healed! I've been following your wrist injury tales since the beginning. I'm so sorry you can't do any of your favorite crafts! Every time I see one of your posts pop up, I'm always hoping your wrists are much better! I dabbled in crochet once to make some slippers (that I never used and were ridiculed by my family, ha). I also think I crochet weird; I just can't get into the flow of it. I've always wanted to make a blanket though, and yours looks great! Even with all the "mystery" attached to it. Good luck with everything! Me too!! No matter how much I crochet I just can't get a rhythm going. I just feel so awkward no matter what, which is a shame because there are a few crochet blankets that I would love to make. Oh well. This is one of the the colorways I used for my granny square "grantangle" shawl. Oh, I love all the colours mixed together! I think Noro is so perfect for crochet! Fantastic!!! Your blanket is what my little square wants to be! :D I also have to agree with the cotton and crochet movements, SO not good for my wrists!! I have a feeling this blanket will take forever to finish! PS: Thanks to your project page I think I know how many more skeins of yarn I'm going to have to find to get this the size I want! 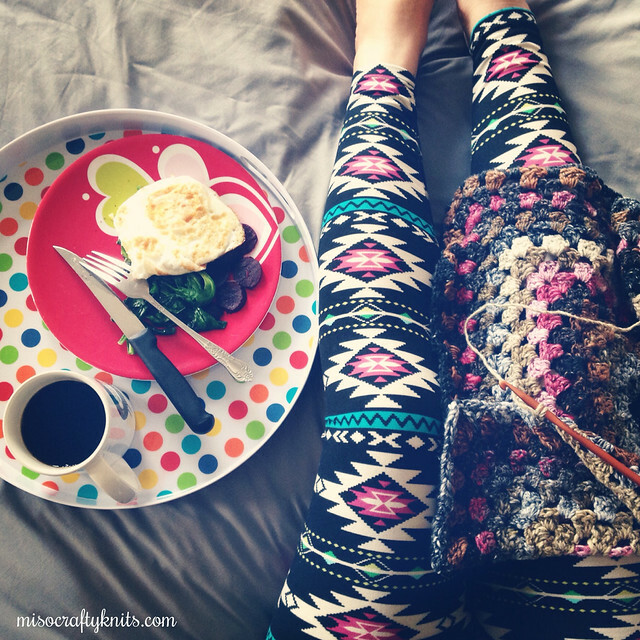 I love that you basically taught yourself to crochet just by winging it! that's awesome. I'm not a crocheter either, but I'd like to learn- I'm left handed, so I hold the hook in my left hand, which is awkward when trying to follow online stuff. I should probably take a class. 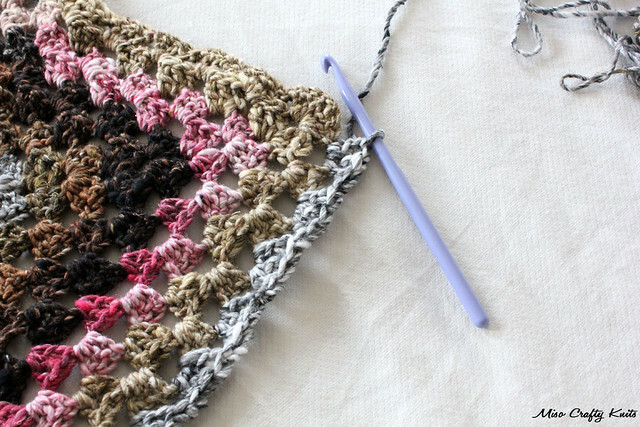 I love the colours you have chosen for your granny square blanket, they look great together. 2008-2016 MisoCraftyKnits. All rights reserved. All text and images are the rights and property of MisoCraftyKnits unless otherwise indicated. Please do not reproduce any images or content from this blog without permission. If you do decide to use photos from this blog, please do not cut off my blog moniker or alter the photo in any way, and kindly link back and give clear and proper photo credit. Copyright MisoCraftyKnits 2008-2016. Simple theme. Powered by Blogger.